Well, there’s two ways to create issues via email. You can use the project’s Public Issues email address to send in issues. Public Issues allow anyone, not just people in your DoneDone account, to send in issues. It’s a perfect fit for customer support or anonymous feedback. From address: Must match the Account Email Address you are using for your DoneDone account. 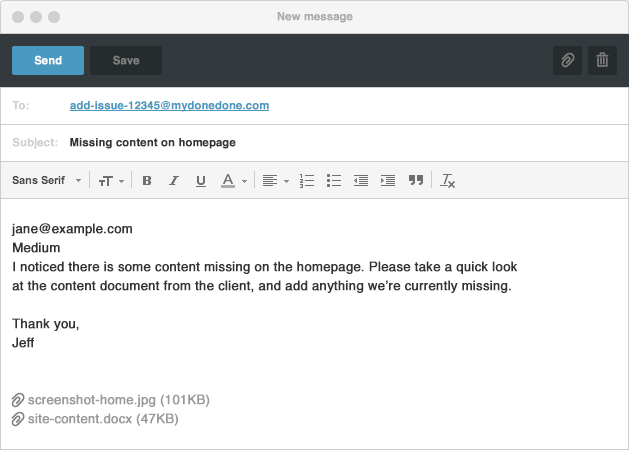 So if you’re using your work email for DoneDone, be sure to email the issue in from your work email. You can change your email address on your profile page. Email subject: The title of the created issue. First line of email body: The account email address of the person you want to assign the issue to. Remainder of email body: The description of the issue. File attachments: Any attachments will be included on the issue as well.